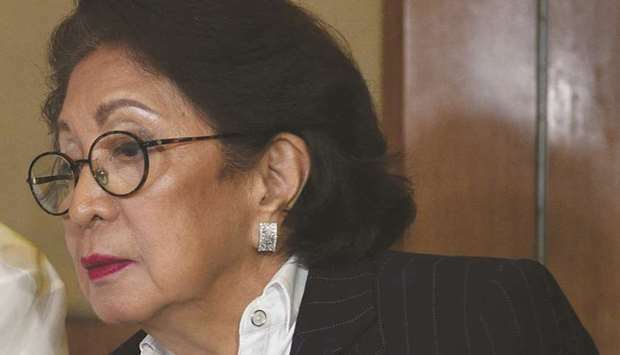 Former Ombudsman Conchita Carpio Morales said the filing of the “communication” against Chinese President Xi Jinping before the International Criminal Court (ICC) was a message to Filipinos that acts of impunity should not be tolerated. “We want to check impunity,” Carpio-Morales said when she faced the media along with former Foreign Affairs Secretary Albert del Rosario at the Manila Polo Club. “It’s not only a message to the Duterte administration. It is also addressed to Filipinos, to similarly situated fishermen, that we demand accountability from those who destroy marine areas, that we want to check impunity as a deterrent for other countries,” Carpio-Morales said. Del Rosario said other countries can file a complaint against those who commit crimes that could be tried by the international court. “If for example we succeed in disciplining Xi Jinping then I think the whole world will naturally follow us,” he said. Carpio-Morales said the ICC has jurisdiction over Xi even if China is not a member of the ICC. Senate bet Neri Colmenares backed Morales and del Rosario’s move. “This is one way of asserting our sovereignty against China. We should use every venue both here and internationally to expose and fight China’s takeover of our seas,” he said. “The West Philippine Sea is ours. The UN Arbitral Tribunal affirmed that. The case now filed in the ICC is an assertion of our legitimate rights over our exclusive economic zone and a means especially for our fisherfolk to get justice,” he added. Magdalo Rep. Alejano also lauded the two former government officials for filing the case before the ICC. “This is a slap on the Philippine government that has failed to exact accountability and punish the countless transgressions of China against Filipino fishermen and the destruction of our marine environment. This is the government’s job,” Alejano, who is running for senator under the opposition coalition Otso Diretso’s slate, said. Bayan Muna Rep. Carlos Isagani Zarate said the country should stand upto China.